Pain Physicians NY (Brooklyn & NYC) the best rated Sports Injury & Pain Management Clinic in Brooklyn provides a full range of Pain Relief Injections as well as an advanced pain management services including marijuana treatment, electrical nerve stimulation for chronic pain among latest cutting edge procedures: Body Composition Analysis, High Tech Shockwave Therapy, groundbreaking Interstitial Laser Therapy and Stem Cell Therapy. Injections are rarely used for pain relief. However, in certain cases, these injections are recommended, usually, when the pain is severe and other treatment options have failed to relieve the pain. Injections are made directly to the affected area. Most of these injections can be done while the patient is still awake without the need for a general anesthesia unless it is done in a delicate region. Pain relief injections are corticosteroid injections in fact. Corticosteroids are a powerful anti-inflammatory medication which works as a fast pain reliever in cases when the pain is caused by an inflamed muscle, tendon, bursa or joint. When administrated by a pain management specialist, they are a safe treatment option and do not cause any complications or side effects. However, in certain cases, like any other treatment procedure, pain relief injections can cause side effects and complications. Bleeding if you are using blood – thinning medications, etc. For what conditions are pain injections used? Cortisone pain injections are used for the treatment and relief of various medical conditions affecting the muscles, tendons, bursa, and joints. They are mostly used for relieving pain which results from an arthritis, osteoarthritis, bursitis, frozen shoulder, discus hernia, sciatica, spinal stenosis, rotator cuff tendinitis, tennis elbow, and many other conditions. Corticosteroid injections prevent a relief when applied on a particular body are, more quickly than with traditional anti – inflammatory medications given by mouth. They are easily administered in the doctor’s office, have a high success rate with a rapid onset of the medication’s action and with minimal side effects as well. Also referred to as a regional nerve blockade, it involves injecting an anesthetic directly onto a nerve or the general area where the nerve is located. The anesthetic can last for hours, days or even weeks depending on the purpose of the injection. For example, a nerve block can be used to relieve pain for a few hours while the patient is being prepared for surgery. The procedure involves introducing a combination of several medications including a local anesthetic, epinephrine, a steroid and an opioid is also often included. The anesthetic is responsible for reducing the nerve’s action epinephrine constricts blood vessels around the area in order to delay the diffusion of the anesthetic, while the steroid reduces inflammation. Opioids are painkillers and may sometimes not be used because the anesthesia can be enough. This procedure is usually done in an outpatient facility especially when it involves an external region. However, sometimes it can involve a delicate body organ, in which case the procedure may be done with the guidance of an X-ray or ultrasound machine. With these complex types of pain, pinning down the specific region can be difficult, so instead the spine is targeted. Most of the body’s nerves originate from the spine, coming out in thick networks called ganglions. These ganglions contain bundled nerves for various general body regions, so a certain ganglion may be targeted that provided nerves for the abdomen and so on. Being a more delicate procedure, sympathetic nerve blocks are always done with the patient under general anesthesia and with the guidance of X-rays. The anesthetic solution, as well as some other chemicals, are injected directly to the ganglion, effectively limiting its function. One of the main uses of pain relief injections is for treating chronic back pain, which is usually as a result of facet joint syndrome. 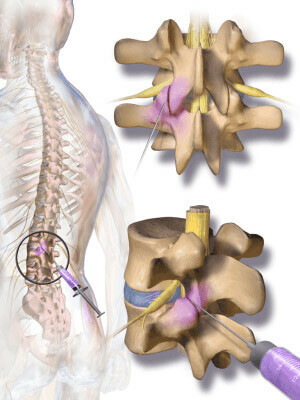 In this procedure, anesthetic, along with steroids and a numbing agent are injected directly into the facet joint capsule with the guidance of fluoroscopy (a form of live X-ray). It is generally not very risky and the pain relief lasts for a few months, so the patient only needs a few injections in a year. If you experience chronic pain and haven’t found lasting relief through more conventional pain treatments, medical marijuana treatment offered by our doctors may be right for you. Call medical marijuana doctor in NYC Boleslav Kosharskyy MD of Pain Physicians NY with locations in Brooklyn, Queens, Manhattan and Bronx NYC to help you determine if medical marijuana treatment is right for your pain. Take the time to research and find a competent medical marijuana doctors in our medical marijuana treatment center in New York City. The right experience and knowledge saves you a considerable amount of time and trouble. The first step toward the lasting pain relief you need is as easy as making a single phone call to medical marijuana doctor Boleslav Kosharskyy MD of Pain Physicians NY with locations in Brooklyn, Queens, Manhattan and Bronx NYC.